Chocolate inspirations left and right this week for BSI, being hosted by London Foodie in NY! In case you missed it, my first entry was Banana Boats. 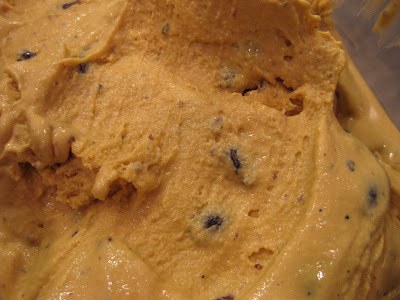 This is the second entry - another homemade ice cream. Both Johnny and I agree that it's our favorites of the ones we've made so far! We followed the recipe for Coffee Ice Cream from Perfect Scoop, but as an extra somethin' somethin' included cut up chocolate covered coffee beans! Because of the inclusion of egg yolks, this was also the most labor intensive of the recipes we've made so far! Pour the remaining 1 cup cream in a large bowl and place a mesh strainer on top. In a separate, medium bowl whisk together the egg yolks (the pic has a little cream around the edge because we swapped bowls!) . Rewarm the coffee-infused milk mixture. Slowly pour the warm mixture into the egg yolks, whisking constantly so you don't cook the yolks. Pour everything back into the saucepan and over medium heat, stir constantly until a spatula is coated. Pour the custard through the mesh strainer, pressing down and moving the beans around to extract as much flavor as possible. (We found it helpful to scoop some of the cream from below over top the coffee beans periodically to loosen up the custard mixture) Discard the beans, mix in the vanilla and finely ground coffee and stir until cool over an ice bath. Chill the mixture and freeze per your machine's instructions. We froze for about 15 minutes, then added the 1/2 cup chopped chocolate covered coffee beans for the final 4 or 5 minutes. This smells, looks, and tastes delicious. It's rich, creamy, and full of hearty coffee flavor. The ice cream alone would be delicious, but the crunchy, chocolatey bits in there give it an extra level of flavor and texture. Don't forget to head over to Hey What's for Dinner Mom? tomorrow to vote for my Best Foodie Fotos (BFF) in Laura's contest!!! Ok, I thought the banana/chocolate combo was the ultimate treat. But, coffee and chocolate ICE CREAM??!! Heaven. Can I have this as my Christmas present:)??? Wow, for someone who doesn't like chocolate, you sure come up with some rich-sounding desserts! haha thanks everybody! I can't take all the credit though. My dad suggested the beans in an ice cream when he was here and I couldn't get it out of my mind!! Christina, that looks delicious. My mom is a huge coffee fan and especially loves chocolate covered espresso beans so I bet she would go nuts for this one. I am trying to figure out where BSI went to after last weeks - any clue?